Submitted by Ute Kaden on 19 December 2006. 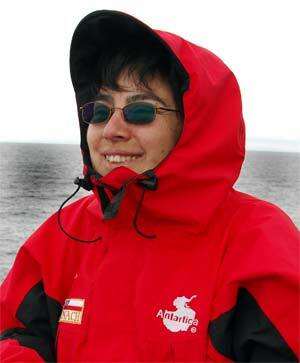 Veronica was born and raised in Santiago, Chile, is 39 years old, not married, studied marine-biology in Valpareiso and is now Head of the Chilean Antarctic Institute. She has been to Antarctica 10 times. What is your job onboard the Oden? Observing and recording of Antarctic marine vertebrates and supporting the international collaborations for Chilean Antarctic research. Why did you study marine biology? I started loving animals as a kid. I wanted to know how their life is, how they exist. I discovered that I like the Ocean too. My grandma had a small house at the beach. Santiago is only two hours from the ocean. What about having a family? What do you do as marine biologist and why Antarctica? I started studying zooplankton along the Chilean coast but was always thinking of the big mammals. Suddenly, like a gift, one o my professors invited me to study Whales in Antarctica. How often have you been to Antarctica? More than 10 times over ten years for 2-4 month, each summer during the breeding season for lots of Antarctic animals. I love Antarctica. Antarctica is a huge, vast continent of extremes and very important for studying our Earth's past and future. We can not stay alone as Chileans. The best ways to coop are international relationships. We are currently closely engaged with NSF (US) and AWI (Germany). Chile has very good scientists and we want to share and in the process increase our own knowledge and science. This attitude is a big change from the politics three years ago. Yes, when I went to school we learned only about five continents. Antarctica was not one of them. The Chilean Antarctic Institute started working with teachers and schools just recently. Being closer to students is our goal. My little brother learns about Antarctica in school now. I am very happy about this. I absolutely love my job. I love my office on the ocean, the animals, and the beauty of nature.